Katy finally found her Prince! 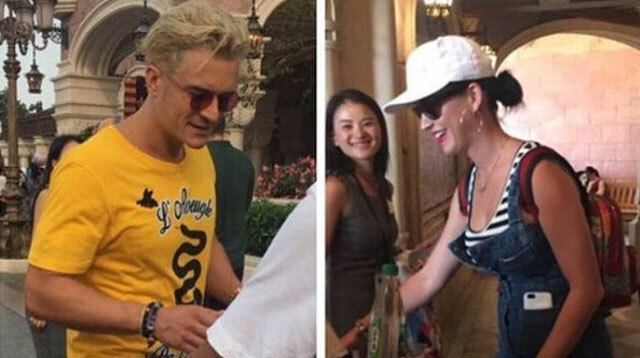 Katy Perry hit up Disneyland in Shanghai, China with her very own Prince Charming last week! The pop star and her "prince" Orlando Bloom hit the resort with the actor's son, Flynn—and the trio had a blast. The “Roar” singer documented the family day out on Instagram, posting shots of the trio on rides and roller coasters, and meeting some of Disney's famous characters, like Goofy. They even checked out the Pirates of the Caribbean ride, which inspired 39-year-old Orlando's pirate movie franchise. "Lit the best ride I've ever been on & not just cause I'm dating a pirate," the singer wrote in one caption. The couple hit the park wearing matching Mickey and Minnie Mouse socks and Katy captioned one shot of their feet touching: "When you find your prince," and added heart emojis. Perry and Bloom have been dating since January. Both have been married before—Bloom was married to supermodel Miranda Kerr, his son's mother, from 2010 to 2013, and Perry was briefly married to comedian Russell Brand.